My mom just held a bridal shower for one of my cousins this past week, and I was blown away by everything she did. I cannot take much credit, most of the decorations were finished when I got there. I love the whole vibe the shower had. It was so simple, but pretty and detailed. I think sometimes showers can get out of control and it becomes more about the 'party' then the actual people and event you are celebrating. For the table, my dad spray painted these little pots gold (the colors of my cousin's wedding are green and gold) and my mom planted succulents in them. The pots served as not only decor, but also as party favors. She used simple carnations for the centerpiece and vintage trays with mason jars on top. Mason jars add a great vintage element to any table. 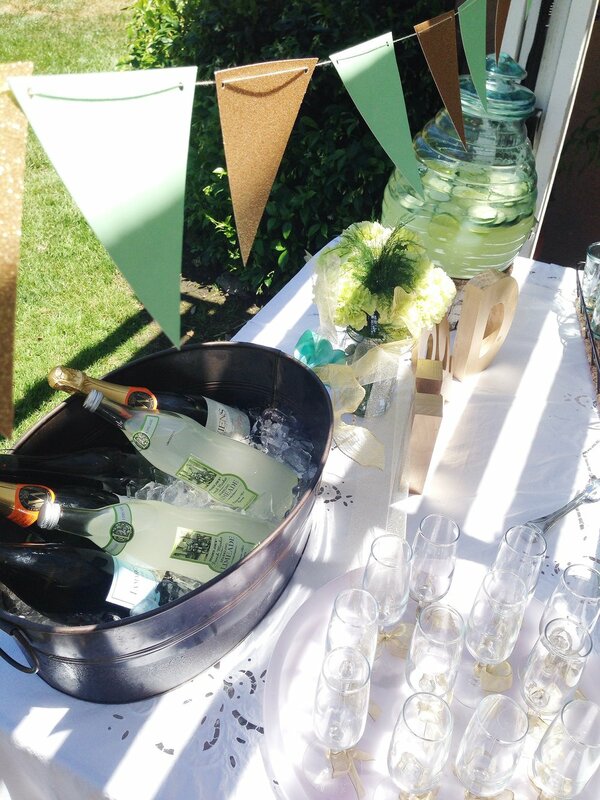 For the drink table, we used this little flag banner to bring in some glitz. The honey comb looking jar had a cucumber lime punch inside which was delicious and super easy to make. My dad cut down a tree last month and sliced the trunk up for my mom to use as decor. She has one slab in the kitchen with a vase on top and it is so 'anthroplogie'! 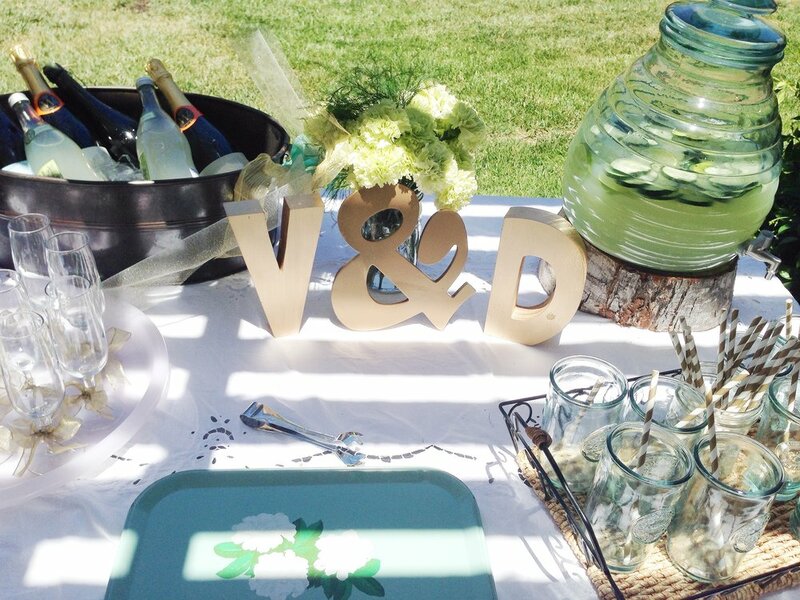 A candy table is always a good idea! We had cupcakes on this stand, with cold sprinkles from Michaels. When everyone arrived we put the chocolate covered strawberries on as well (it was so hot they still melted). Then you can use apothecary jars and fill with candy of whatever color you want. 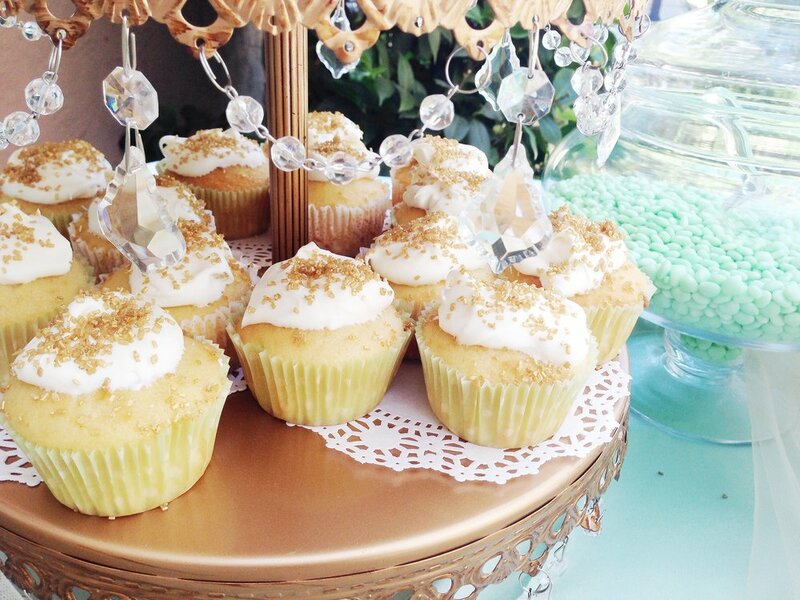 Looking at all these pictures is making me crave champagne and sweets!!! It turned out to be a wonderful shower, and I can't wait for the wedding!